Kat Lee Bounty Hunter 2 is the sequel to the original Amaya 'Kat Lee Bounty Hunter' game which was quite a hit when released. Amaya and Lightning Box Games are now offered via the Toptrend platform too which means various developers now have a uniform skin for their slots, like Rabcat and others offered through Microgaming's 'Quickfire' platform. As before there are 40 pay lines on a 5-reel 3-row slot. Kat herself is a Wild on reels 2, 3 and 4 and doubles any wins she appears in. 5-of-a-kind Wilds pays 25x stake and the highest symbol pays 12.5x stake but would obviously be doubled if including a Wild. The lowest card symbols pay 3.75x stake for 5. There is the dramatic music in the background that you would expect for a heroine like Kat. If you land 3 or more scatters you are awarded a choice of free spins. The choice is always welcome rather than having the slot foist it's choice upon you, so which of these 3 would you prefer? 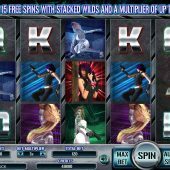 You can opt for 8 free spins where the doubling Wilds on reels 2, 3 and 4 become expanding. This would mean quite substantial hits if you could land all 3. The second of Kat's offerings is 10 free games but this time any Wilds appearing are frozen, so are 'sticky' Wilds for the reamining spins. Again this has potential. Your final choice is to opt for 15 free games with stacked Wilds on reels 2, 3 and 4 but also a multiplier of up to 6x on wins! Unlike the features described above the 15 spins can retrigger too and again are capable of some pistol-whipping wins especially as Wilds double.